Support "RIDE ON!" 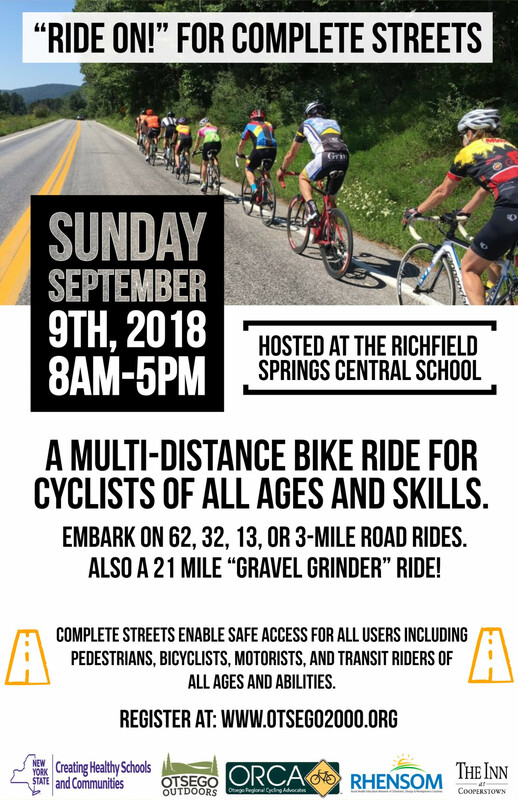 For Complete Streets on Sunday, September 9th, 2018. Enjoy 62, 32, (21 "Gravel Grinder" ride) 3-mile road rides during the beautiful fall season in upstate New York. Starting at 8am, start times will be staggered to encourage support for all riders at end of the rides. Complete Streets are streets for everyone. They enable safe access for all users including pedestrians, bicyclists, motorists, and transit riders of all ages and abilities. Complete Streets make it easy to cross the street, walk to shops, and bicycle to work.